Syrian rebels shot down another regime helicopter near a military airbase in the northern province of Aleppo on Monday, as warplanes pounded towns across the country, the Syrian Observatory for Human Rights said. 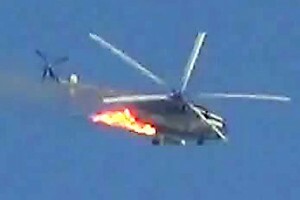 “A helicopter was seen falling from the sky as it burst into flames after it was hit near Minnigh military airport,” which rebels have been trying to storm for months, the monitoring group said. In the west of the province, rebels pressed on with attacks on a police academy, taking control of a building where troops were entrenched , the Observatory said. At least 46 combatants — 16 rebels including a battalion commander and 30 troops — were killed over the past 24 hours in the battle for the military academy outside the town of Khan Assal, it said. Elsewhere, the Britain-based Observatory said, warplanes bombarded the southwestern and eastern outskirts of Damascus in an protracted bid to dislodge rebels from their rear bases, killing two people, including a child. Fighter jets also raided the towns of Dael and Mleiha in the southern province of Daraa, cradle of the uprising against President Bashar al-Assad that broke out in March 2011 and has left 70,000 dead, according to the United Nations. On Sunday, at least 141 people, including 61 civilians, were killed in violence across Syria, according to the Observatory, which relies on a vast network of activists on the ground and medics. Good, the more the better.